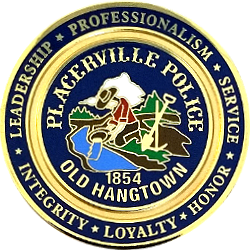 At the Placerville Police Department, "We are committed to providing the highest quality of service to our community while constantly improving the quality of life our community desires and deserves." We strive to achieve this through our many different programs, and it would not be possible without our dedicated and professional employees. The Placerville Police Department is comprised of 20 Sworn Officers and 11 Professional Staff. 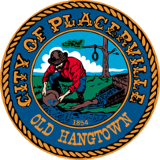 Placerville Police Department strives to provide professional service to the community and partner with it to maintain a high quality of life. We use the latest police practices and guidelines to effectively serve the local community with active participation and outreach. in 2013 we implemented two very significant means of alerting our citizens by phone, text, and email from community events and advisories to high level alerts through the use of the Placerville and County of El Dorado OES residential phone based alert system known as Code Red . Additionally, we are incorporating technology with public safety through the use of mobile phone text and email based Nixle alert system for those within the city limits and outlying areas. This adds yet another layer of safety, protection, and awareness to the community. We are active in community meetings such as; New Morning, Boys and Girls Club, Elder Protection Unit, Parent Project, School Attendance Review Board, Crisis Intervention Team, Skate Park, Domestic Violence Council, Child Abuse Prevention Council, and many more. We have officers who volunteer as coaches, and board members of various volunteer organizations. If you have had recent contact with a member of our department, we would like to hear about it. Please complete our " Praise an Officer " form and let us know. If you have ever been interested in a career in Law Enforcement, please visit our human resources page to check our current recruitment positions. Thank you for visiting our site and we hope that you have enjoyed your visit to historic Placerville.